Lucien Pissarro (fig.1) was born on 20 February 1863 in Paris, the eldest of seven children of the impressionist painter Camille Pissarro (1830–1903) and Julie Vellay (1839–1926). Lucien first visited England with his family in 1870–1 during the Franco–Prussian war, staying with relations in Upper Norwood on the outskirts of London. 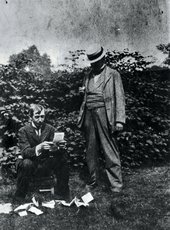 Over a decade later in 1883–4 he again came to England, living with family in Holloway Road in north London, to learn English and to work in the office of a music publisher. Like his father, Pissarro was both a painter and an illustrator; he returned to France in 1884, working as a landscape painter while also making an income producing book illustrations, and he showed with his father in the last impressionist exhibition in 1886. During this time back in France he met and worked with the painters Paul Signac and Vincent van Gogh; the latter dedicated an 1887 painting, Basket of Apples, ‘à l’ami Lucien Pissarro’ (Kröller-Müller Museum, Otterlo).1 He also exhibited at the Societé des Artistes Indépendants in Paris for the first time in 1886, and in 1888 was on the Hanging Committee with Signac and Georges Seurat, alongside whose work he exhibited under the title of ‘Neo-Impressionist’ in Paris in December 1892–January 1893 and December 1893–January 1894. Pissarro’s permanent move to England in November 1890 was in part a response to his admiration for William Morris and the illustrators of the Arts and Crafts movement, and he lectured on impressionism at the Art Workers Guild in 1891. He stayed also for his attraction to Esther Levi Bensusan (1870–1951), whom he had met in 1883 during his first visit to England. The couple were married in Richmond on 10 August 1892. Their honeymoon was first spent in Rouen and then they stayed for eight months at Camille and Julie Pissarro’s new house in Eragny, in the countryside north-west of Paris. Pissarro continued to visit the Eragny home regularly over the years.